This recipe serves 2 very hungry people, or 3-4 not so hungry people! I hate to throw away the left-over hunks of sourdough bread which we all end-up with, so here is an idea for a luxurious treat to make the most of those stale crusts! The bunches of fresh onions and garlic are appearing on the stalls of the markets across the Vallespir region, and although we are at the end of the leek season, this pairing just works too well to miss the opportunity. This dish is perfect for any cool spring evening and is great soul food! The key to the success of this dish is to slow-cook the leeks, onions and garlic, to use a good quality stock (ideally homemade), and good quality sourdough (ideally your own homemade!). Should you have any leftovers, simply fry it and serve with crispy bacon and a poached egg for breakfast or brunch. You could replace some of the Reblochon with a mild, creamy, blue cheese and a sprinkle of toasted walnuts if you fancy a change. Sweat the leeks, onions and garlic in the olive oil with a pinch of salt, in a covered pan over a very low heat until they are meltingly soft. This will take at least 1 hour 10 minutes. Remove the lid from the pan, increase to a medium heat, and cook the leeks, onions and garlic until they turn a golden brown. Pleace a layer of sourdough pieces in the bottom of the cassola or gratin dish (about one third of the bread). Spoon half of the leeks, onions and garlic over the bread pieces (including the cooking oil). Tear half of the spinach leaves into pieces and scatter over the cassola/gratin dish. Top the spinach leaves with one third of the Reblochon and drizzle over one third of the stock. 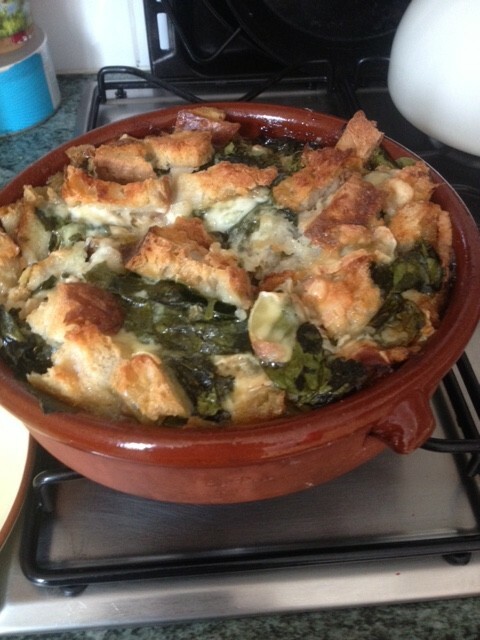 Repeat with another layer of leeks, onoins and garlic, then another layer of bread, spinach, cheese and stock. Press the layers down. Finish with a final layer of sourdough pieces and the final slices of Reblochon. Then drizzle over the last of the stock. Lay a piece of baking parchment over the top. The dish can be prepared to this stage then refridgerated for up to 2 days. Pre-heat the oven to 140C. Place the panade (with the piece of baking parchment over the top) into the oven and cook for about 1 hour 45 minutes. The top should be golden and cruchy by this point, if not, remove the baking parchment, turn up the temperature slightly and cook until the top is golden. You could serve the panade with some steamed chard or spinach, some spinach salad or lambs leaf salad, and if you need to include some meat try it with grilled pork chops or sausages. I have occasionally served this with a dollop of homemade coleslaw on the side!